Back in the old days when Ars Magica v3 was new I think the rules for Wizard’s Wars stipulated that both parties had to agree to the conflict. Either it was in the book, or the guys I played with made that house rule. Sure, a big nasty wizard could threaten another, intimidate, or whatever, but could not just declare a war and start killing somebody else. In v5 one wizard can declare a war on another, and it just starts automatically a month or so later. No acceptance, no agreement. Fight or flee. In the flavour and fluff a WW is meant to be a way to resolve disputes and is also meant to be a last resort. It is also meant to be frowned upon by the Order of Hermes for a wizard to start waring with many people, or the same people repeatedly. We also have a setting in ArM v5 which presents a more orderly, bureaucratic, and safer Order of Hermes than older editions. The Order accepts and has laws that allow bullying and murder in the oaths. I find that combination of views an incongruity, and it bugs me. How could it possibly be safer? Younger wizards are at a huge disadvantage, and specialists in certain type of fighting will be hard to stop by non-specialists. There is also an implication that the result of a Wizard’s War isn’t lethal. This doesn’t make any sense either. As the defender in a war which wasn’t desired, if you survive, you better power-up and kill that attacker. And make sure you wipe him out. If the attacker misses the first time, you might have some breathing space, but eventually it will happen again. Entering a potentially lethal conflict isn’t something anyone does lightly, and the instigator of a war probably knows what they are getting into. The Order in the present cannon offers you no protection except somebody waggling their finger at your killer afterward. I do not understand the idea of surviving a life threatening (magical) attack and then not expecting it to happen again. The current lore places the typical starting scenarios so close to immediately lethal that all the exceptions are feint edge cases. Huh? Hardly safer. In my games the wars have to be agreed and sanctioned by the Order. That gives the tribunal the overview of the activity, and also control of harassing behaviour before wizards start dying. It’s not cannon, but it makes far more sense in the setting. The Order of Hermes didn’t grow to it’s size by wizards casually murdering each other, so any type of one-sided sanctioned murder is silly. The rant I wrote at the introduction to this series has been bothering me a little. The Ars Magica rules are fair and reasonable, and solid in terms of they’ve not had a large degree of change since the very early days in terms of how Magical Resistance (a.k.a. MR) and Parma Magica worked. The rant is a criticism of that design, but I openly acknowledge that the game gave fair open warning to that aspect. So what options does a transformation wizard have to still have wonderful and exciting forms, but also actually attack and defend themselves against opponents with MR? Firstly defense is very (mostly) simple. In most interpretations of the MR rules a creature not under an active magical effect, or using an effect which is part of their essential nature (say a passive regeneration power in a supernatural bear) will be able to ignore the defending Magi’s MR, as the effect is “natural enough” to it’s essential nature. There are some variations in the edge casts regarding the Pink Dot effect, but generally most games ignore those who use the pink dot techniques. For attacking the rules are very strict with regard to penetrating MR. Essentially the attacker cannot “touch” the target because their attack stops short because the magic of the transformation cannot work through the defenders MR. But for a moment consider a sturdy shield grog who happens to be carrying a few nasty but mundane weapons. That grog can kill a person with MR if they can get close enough, and no amount of MR will assist. The grog simply has to hurt the person the old fashion way, using their weapon of choice – say a nice sharp axe. That grog can also be teleported by magic behind the target, enhanced with magic to be physically stronger or tougher (ala Gift of the Bear’s Fortitude), and also be wearing magical equipment and they can still swing and hit the defender as normal, because the axe isn’t enchanted. Seems a fair way to kill a wizard, or a creature with MR. This means that a person transformed or enhanced using hermetic magic can still strike and harm a defender with MR when they use a weapon that is mundane, or a part of their body is specifically not transformed (say a fist, foot, or face), or a mundane weapon is incorporated into it the form but the magic is not active upon it. Here is a scenario – a special set of steel bear claws are crafted, think of them like a large set of fighting claws. Then the crafty wizard designs a hermetic spell is specifically to transform the target into a large hulking giant, and uses the bear claws in the design. When the attacker swings the claws will not be resisted, as they are not part of the spell. When this scenario is expanded for the use with huge transformation spells it means that the caster needs to have crafted weapons appropriate to the form and design the spell with them in mind; and also need to have them on hand when casting. That could be a Rego based craft spell to customise them in short order depending on size needed; but generally the caster should do some prep. Or they could be crafted well in advance, and then use Muto magics as lesser enchanted devices to transform them into something small an innocuous, and the caster ends the spell when the huge weapons are needed. It is complex, but it means the 40 foot long dragon might actually have teeth, tail and claws that can inflict real damage to any opponent, not just a mundane target. A weapon set could be crafted as always present, magically hidden, and then appear to hand when needed but then be a normal mundane item with no active magic. A cheat for MR? Kind of. Certainly better than fusking around with the MR rules. Another quick transformation effect, this time to duplicate the appearance of a specific person. There are those times when a general spell for altering your appearance isn’t going to be accurate enough. This effects alters the target to an exacting copy of another person. The target’s look, sound, and smell are altered to match; including the target’s clothing and equipment. Ideally the person to be copied should be present at the time the spell is cast, or a highly detailed likeness be present. Like many similar effects the quality of the copy is subject to a Finesse check, with a general target number of 6+ for cursory inspection, 9+ for a fair copy that will pass almost any inspection, through to 12+ for a perfect reproduction. The Finesse check should be modified by the familiarity and knowledge the caster has for the target to be copied, and as this effect is designed to copy a specific target – the caster gains a +3 to the Finesse check if the source for the duplication is present during the casting. This is a more specific version of the Disguise of the Transformed Image effect from the core rules, which has been increased in difficulty to allow a superior level of detail in the reproduction. As DotTI could actually perform this effect, the real difference is that this effect is designed to duplicate the full appearance of another target with a very high degree of accuracy, where DotTI allows ad-hoc changes in appearance. I’ve had this effect in draft for a long while during the time where I thought about if it would be used. Frankly I cannot see a common application unless a saga specific use arises. Altering one grog to look like another. But then the opportunity to make a grog appear as a specific NPC and enact a role could be greatly leveraged with a little creativity. So it is a very specific spell, which might be rarely used, but powerful in application. 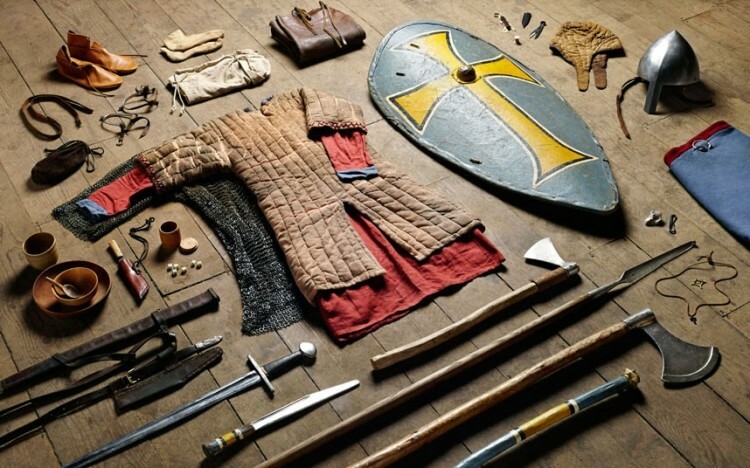 A quick aside – a soldier’s kit from 1066 has been recreated and photographed as part of a series on the typical kit carried by soldiers across a range of time periods; via Laughing Squid’s post. I find this photo to be very evocative of the period, something about it is right. I’ve had this spell in mind for years, perhaps decades, and never written it up. An NPC wizard of mine in a 1990s Ars Magica game used to transform himself and also animate statues, but I’d never written it properly. In simple terms the person is transformed into a living statue, or as I like to think into an almost unstoppable juggernaut. An animated status is almost unbeatable by mundane means. Normal weapons are not designed to damage creatures like this, and likewise defending against one would be a terrible challenge. Given the effect that transformation has on targets with magic resistance this is a very defensive form, and not without some drawbacks. The target will find themselves weighing far more than most structures can tolerate, and looking totally unnatural. The caster’s body is transformed into solid metal, which can move as normal. A metal pin is applied during casting, and removed by the caster to end the effect prematurely if they wish. Casting requisites are required for carried equipment, although clothing and personal effects are also transformed. It is certainly possible to make the effect a little lower to only transform to stone (-5 levels), or allow a longer duration as Sun (+5 levels), but this is what I have in mind or a current character.